Board of Water Commissioners meeting Sept. 7, 2012. (Left to right) DWSD Director Sue McCormick, nine months on the job, BOWC Detroit member Linda Forte, a Comerica bank exec, BOWC chair and Oakland Co. member James Fausone, who was president of an environmental remediation, industrial service, and waste transportation company for three years, BOWC member Macomb County rep. Fred Barnes, who owns his own engineering consulting company and is a West Point graduate, and former BOWC chair Mary Blackmon of Detroit, also head of Wayne County RESA..
DETROIT – The Detroit Board of Water Commissioners (BOWC) is bailing out on the city as a state takeover looms, essentially colluding with Gov. Rick Snyder and Wall Street. They plan to sever the Water and Sewerage Department completely from the city, replacing it with two regional authorities. Root Cause Cttee. members (l to r) Special Master David Ottenwess, Council members Gary Brown, Charles Pugh, BOWC chair James Fausone, DWSD COO Matthew Schenk, DWSD Director Sue McCormick. They will vote on the plan, set forward by the “Root Cause Committee” appointed by U.S. District Court Judge Sean Cox at a special meeting Wed. March 13. 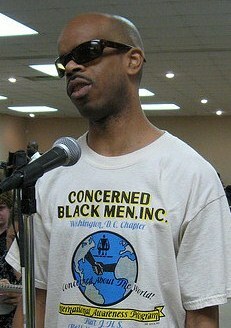 The meeting will take place at 2 p.m. on the fifth floor of the Water Board Building, 435 Randolph in downtown Detroit. Judge Cox, who oversees the sewage side of the department under a 1977 federal consent decree, would then have to approve the action. For the complete power point presentation of the plan, click on DWSD proposal to control our own destiny. WWTP worker on strike Sept. 30, 2012. DWSD is the third largest water and sewerage system in the country, serving six counties including 40 percent of Michigan’s population. DWSD has $6.4 billion in assets according to its 2012 financial statements. The people of Detroit have sunk billions of dollars into bonds to build the system since it was established in the early 1800’s. Adjacent suburbs did not want the expense, so they connected with DWSD. Current DWSD bond debt, which is an asset to Wall Street bondholders, amounts to over $6 billion. In exchange for ceding control of this multi-trillion dollar asset, payment of $35 to $50 million annually is obviously a mere pittance. The Root Cause Committee claims the move would prevent the sale of DWSD under either an emergency manager or under bankruptcy. However, the proposal claims the City of Detroit would still own the department, so that argument literally does not hold water. By including what amounts to “ghost” ownership in the proposal, the Committee is also attempting to circumvent the City Charter. Mary Shumake, now passed, and others take part in Michigan Welfare Rights Organization protest at Water Board Building. 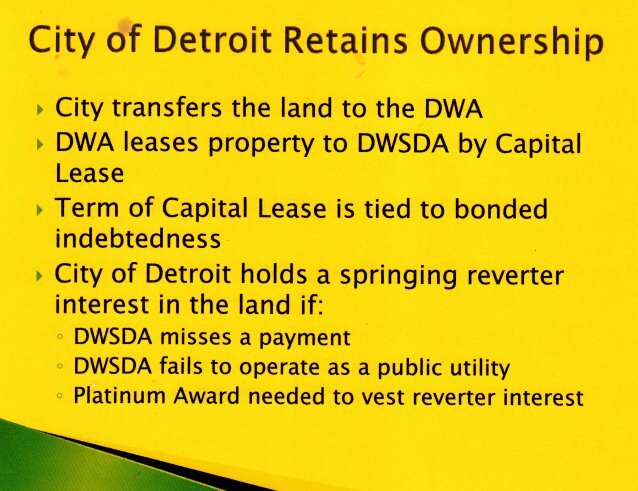 DWSD is BLACK-OWNED by the City of Detroit. Sec. 7.1204 of the Charter says, “The City shall not sell or in any way dispose of any property needed to continue the operation of any city-owned public utility furnishing water and sewerage service, unless approved by a majority of city voters voting on the question at a regular or special election. 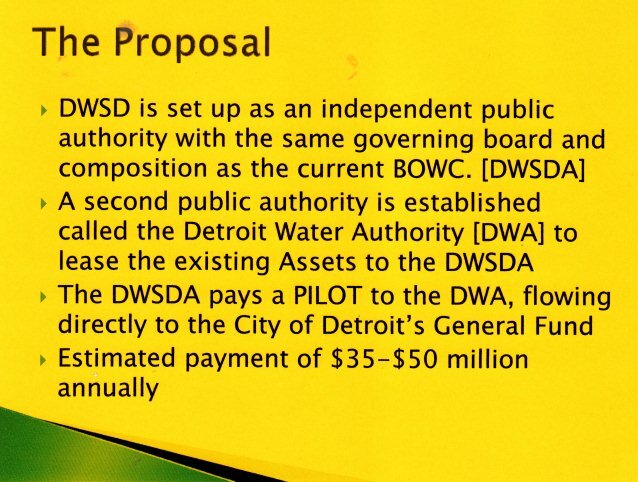 The proposal says that the city of Detroit would “transfer” DWSD land to the DWA, a clear violation of the Charter if no vote of the people takes place. Clay said that to protect the Water Department and other assets of the city, attorneys for the people should immediately file for a federal injunction against the state’s planned takeover of Detroit, citing violations of the Voting Rights Act. Members of Local 207 picket Water Board Building in rain Sept. 7, 2011. Local 207 of the American Federation of State, County and Municipal Employees (AFSCME) represents the largest sector of water and sewerage employees. It is currently awaiting a decision from the Sixth Circuit Court of Appeals on its own legal action. The local appealed Cox’s previous orders which partially separated DWSD from the city and grossly violated union rights. 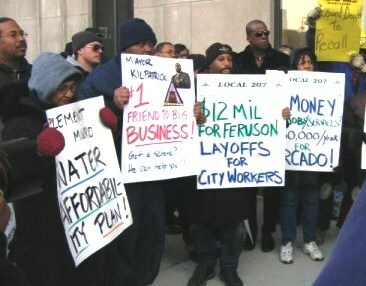 Local 207 picket cites Kilpatrick, Ferguson corruption and privatization of DWSD. John Riehl, a DWSD worker who was the long-time president of Local 207, said the current Root Cause committee move is aimed at making more profit for contractors than former Mayor Kwame Kilpatrick ever dreamed of. A federal jury convicted Kilpatrick, DWSD contractor Bobby Ferguson, and Kilpatrick’s father yesterday of numerous federal charges involving bribes paid by contractors. Kilpatrick and Ferguson are currently locked up in the Milan Federal Penitentiary awaiting sentencing. They face dozens of years in prison. Riehl said that currently DWSD is bringing in contract workers qualified only for entry level positions, and dropping them into highly-skilled jobs, endangering the safety of the six-county water supply. Experienced long-time city water workers are retiring in droves, Riehl said. He said a likely scenario under an authority would be to sever all current city workers at DWSD, then have them re-apply for their jobs. 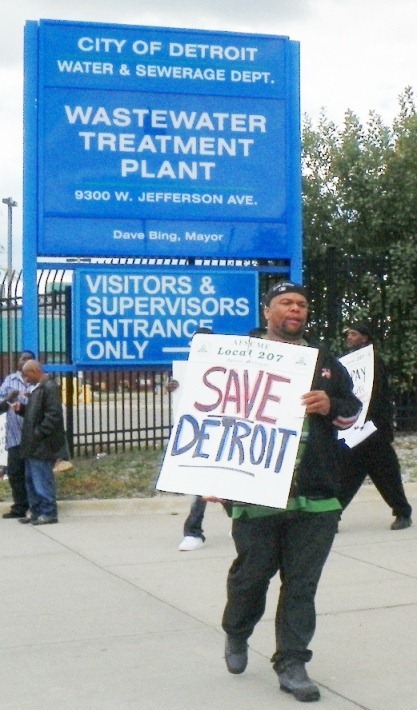 Nearly all of Local 207’s members are Detroit residents, and most of them are Black. 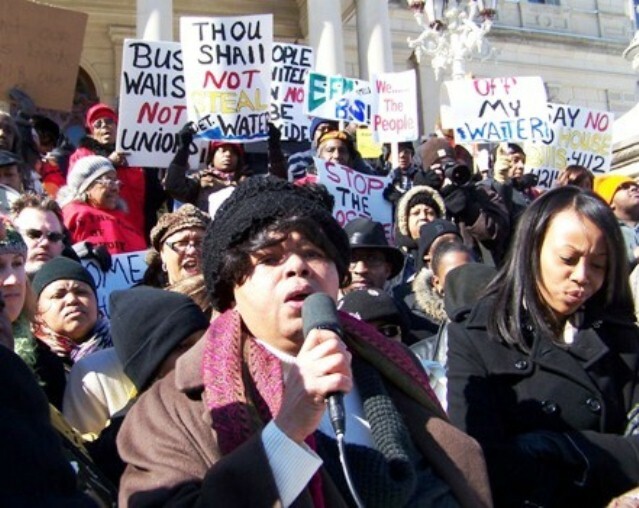 The authority would then be able to reject workers such as those who carried out a heroic strike at the Wastewater Treatment Plant to “save Detroit” last September. 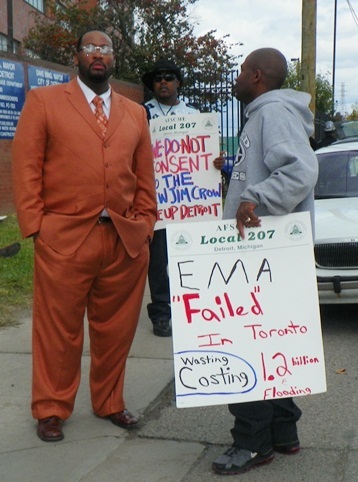 Striking WWTP worker says EMA failed in Toronto. DWSD has also hired the EMA group, which is enacting a plan that may cut 81 percent of the current workforce., on a piecemeal basis after the Detroit City Council refused to approve their entire $47 million contract. Under the new structure, the City Council would no longer have a say in DWSD contracting. A federal Environmental Protection Agency study of the plan, done last year, did not enjoin it, but only indicated that continued EPA oversight would be necessary. The Root Cause committee claims the proposal would “reduce Detroit’s long-term liabilities by roughly 50 percent,” citing $6 billion in DWSD debt, and DWSD’s share of OPEB (other post-employment benefits), and UAAL (Unfunded Actuarial Accrued Liability). 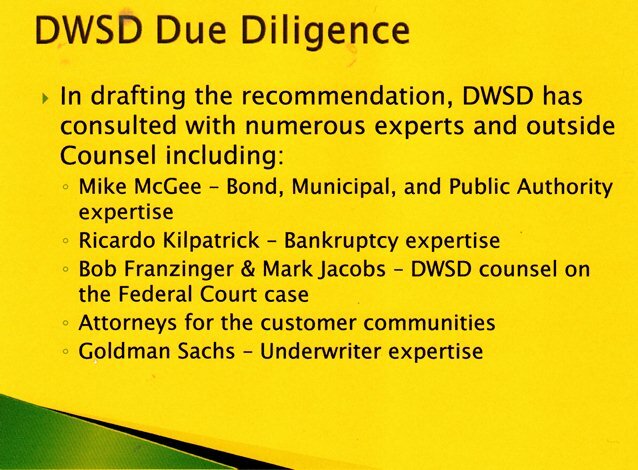 It says that DWSD debt ratings have been negatively impacted by the department’s connection with Detroit. It fails to note that one of the three major Wall Street ratings agencies, Standard and Poor’s, is facing a $5 billion fraud lawsuit brought by the U.S. Department of Justice which claims it had numerous conflicts of interest in mortage-backed securities ratings it gave banks. 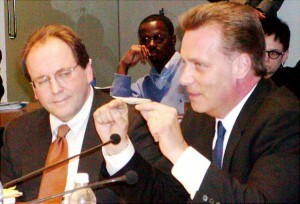 Joe O’Keefe of Fitch Ratings and Stephen Murphy of Standard and Poor;s sell predatory $1.5 billion POC loan to Detroit City Council in 2004. After 2008 crash, Detroit defaulted twice on the loan. One of the Detroit’s major debtors, UBS, just paid a $1.5 billion fine to the USDOJ for interest-rate rigging related to the LIBOR scandal. Standard and Poor’s and other ratings agencies have indeed downgraded DWSD debt, and sent City of Detroit ratings to the lowest sub-basement possible. However, such actions end up profiting debt-holders, because they can charge usurious rates of interest. Such debt is actually an asset to Wall Street banks, which actually pay the ratings agencies. 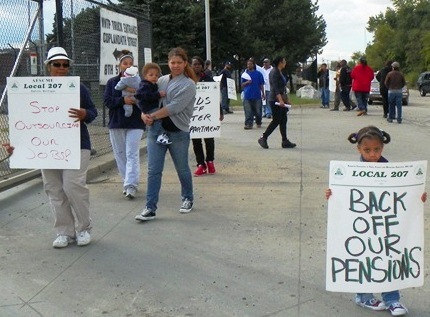 WWTP strike: a little child protests attack on her parent’s pension. So that’s $6 billion worth of assets to Wall Street under the proposal deal. The committee’s assertions regarding OPEB and UAAL related to retiree pensions and benefits, imply that the authority may sever its workers from the city pension funds. Riehl, who also sits on the board of the Detroit General Retirement System, said that would reduce DGRS holdings by a third. The proposal does not address what bodies it would set up to handle DWSD retirees’ pensions and benefits. However, a glimmer of what may lie ahead is included in the following Root Cause slide. Goldman Sachs, previously the world’s largest investment banker, is notorious for the $4 billion in profits it made just prior to the 2008 economic meltdown, by “betting” on a collapse in the sub-prime mortage market in 2007. Goldman Sachs profited from 2008 meltdown. 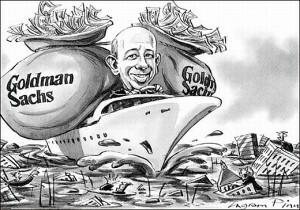 Goldman further profited from a $10 billion U.S. Treasury investment in October 2008, as part of the Troubled Asset Relief Program (TARP), although it was not itself in distress. It has since paid back that loan, but how much it made in profits as a result of the loan has not been publicized. Tax payments by Goldman Sachs WORLD-WIDE were $14 million in 2008, compared to $6 billion in 2007. The effective tax rate thus dropped from 34.1 percent to one percent. Many critics have said this was achieved by shifting its earnings to 28 subsidiaries in nations with low or not taxes, including 15 in the Cayman Islands. Thanks for the (unneeded) bail-out, Uncle Sam. 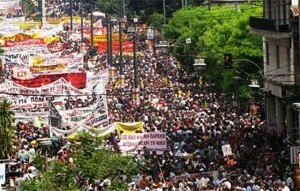 Massive protest in Greece against austerity measures improsed to pay off debt to IMF. The SEC has also brought a number of “insider trading” cases against Goldman Sachs brokers. In 2012, Goldman Sachs got into further hot water in Houston when stockholders of El Paso Corp. sued it for conflicts of interest in the sale of their company to rival Kinder Morgan, a natural-gas pipeline operator, for $21.1 billion. El Paso shareholders said cited conflicts of interest including that fact that Goldman Sachs, a banker for El Paso, owned a 19 percent stake in Kinder Morgan though its private equity group. 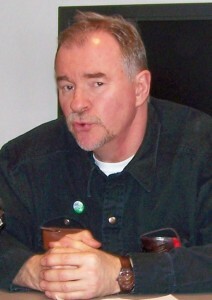 “Mike” McGee (back to camera) advises Bing et. al. on the consent agreement. 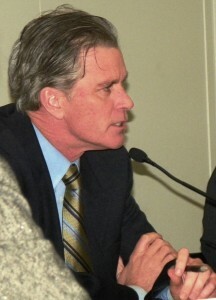 Attorney “Mike” McGee, cited in the slide, is a co-author of Public Act 4, “the dictator act,” which Michigan residents overwhelmingly repealed in Nov. 6, 2012. He acted as counsel to Detroit Mayor Dave Bing during City Council hearings on the disastrous “consent agreement,” and counsel against the city as represented by former Corporation Counsel Krystal Crittendon in an unsuccessful lawsuit to overturn the consent agreement. That lawsuit cited over $300 million in debt owed to Detroit by the state. 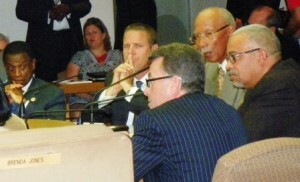 Treasurer Andy Dillon told City Council members the state would keep paying them if they went along with the takeover. McGee was also bond counsel for the city, the state, and the state Municipal Finance Authority in negotiating a $137 million state loan to Detroit. State Treasurer Andy Dillon has since doled out the loan in pieces to get the City Council to approve the re-hiring of Miller Canfield, the hiring of Miller Buckfire, and other corporations. Of the original amount, Crittendon, who is running for Mayor, has said that $50 million is still outstanding and was not included in the state Financial Review Team report on Detroit’s finances. Later in the presentation, Miller-Buckfire, now owned by Stifel Financial, is included as the appraiser of annual payments to the city. VOD exposed Stifel’s many federal convictions of fraud and pending lawsuits involving entities like the Milwaukee School District, in an earlier article. Last November, VOD exposed the fact that City Council President Charles Pugh and Pro-Tem Gary Brown sit on the Root Cause Committee signed a document asking for separation. Both Council members have received extensive campaign finance contributions from DWSD contractors over the last period. 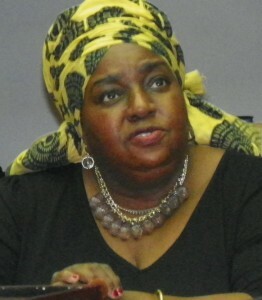 Councilwoman JoAnn Watson at Council meeting Jan. 28, 2013. Councilwoman JoAnn Watson said at the time. “This is nothing but a takeover, a power grab for the largest asset the city holds. It would be malfeasance for any elected official to advocate breaking it up, divvying it up. AND MUCH MORE IN THE PAGES OF VOD. Sandra Hines speaks at Feb. 2011 rally in Lansing against takeovers. 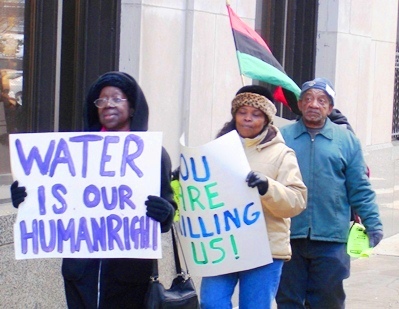 To print formatted document of this story, click on GRAND THEFT OF DETROIT’S WATER DEPT. IMMINENT. ***The 2013 MOTOR CITY WATERGATE*** (Players Get Played) Smiles!!! James Fausone chairs BOWC and also is Westland City Attorney. It is a flagrant conflict of interest and he should be fired from BOWC by Cox. Fausone is the spiritus movens of root committee and BOWC. He should be also investigated.